This toolkit has been written to help you feel good about being you. It will leave you looking better, feeling great and having a much clearer sense of focus. It will help you acquire essential self-empowerment skills, teaching you to structure your life to reach personal objectives. Part one focuses on the need to feel better about yourself and your health, and includes questionnaires to monitor your own improvement. You will learn skills for self care and better health, how to understand and use your strengths, and how to become a ‘doer’ through setting clear goals. Suitable for anyone who wants to feel the benefits of an energising 30-day programme, and particularly beneficial to those facing challenging circumstances, whether related to their job, family, relationships, or recovery from illness or addiction. The toolkit also provides excellent tuition to anyone wanting to teach basic empowerment skills to their clients. Author Catherine Dixon is a wellbeing being coach, therapist and teacher with nine years’ experience in professional practice. She works within the NHS and other public bodies, and in the private sector, and has a background in business, corporate training and IT recruitment, which informs her practical solutions-focused approach. 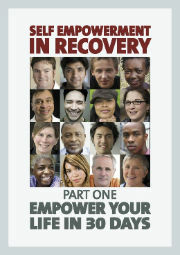 Please click here to see selected pages from the toolkit.